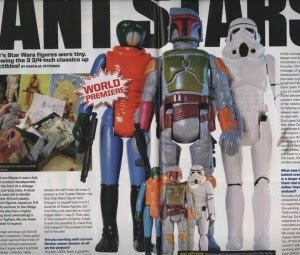 While reading this months issue of Toyfare I come across an article regarding these cool vintage Star Wars 3 3/4 action figures re-created by Gentle Giant in a 12 inch format. These figures were re-created from scans of mint 3 3/4 vintage action figures and are exact in every detail with the exception of size. The figures even come with faithfully re-created weapons and backer cards. The first figure released was a Stormtrooper, which was a San Diego Comic-Con exclusive and sold for $85. "Just like when you were a kid, only BIGGER! Gentle Giant is proud to debut their new line of vintage Star Wars Action Figure reproductions with the release of this classic Empire Strikes Back Stormtrooper. One really cool thing about these beauties is the clam shell that protects the blister card is removable so you check the figure out or display it the way you want. The next figure released was Boba Fett for Celebration V... just in time for the 30th anniversary of The Empire Strikes Back. There are 8 more figures in this collection scheduled to be released. Gentle Giant has hopes that they will produce 12 inch versions of all 90 classic vintage Star Wars Action Figures. I got to collect them all. They look sweet. What do you think about the new figures? cool idea I guess but way too expensive. You're probably right. If they release all 90 it would cost almost $8,000 to collect them all. I'll just have to get a couple of my favorite's. That's true. I am probably only going to pick up a couple of them.